8CH*1080P/12CH*960P/8CH*720P video input(onvif IP camera),ensure this nvr is suitable for you to connect different Pixel ip camera(720P/960P/1080P );VGA/HDMI video output,HDMI port provides high definition digital image. One Key connection:Select"Quick set" mode---Automatically search and add front-end ip device,to the frint-end device may automatically assign ip address.Ensure the cameras can be connected with different ip address,avoid ip comflict. 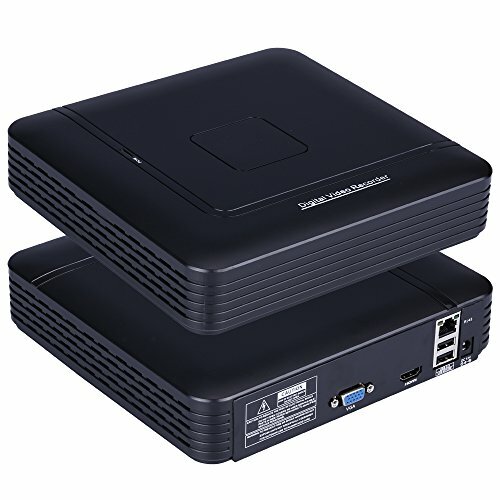 Small Dimension: 200(width)X210(deepth)x43(hight)mm,small footprint, don't worry about wasting space with this mini nvr, still can support 3.5" HDD up to 4TB storage (HDD is not included). Smart phone remote viewing: Monitor remotely your home anywhere,anytime by installing "XMeye" APP(Scan QR to download mobile app); push alert notifications when movement is detected . NVR comes with USB Mouse,Screws , and Power adapter(12V 2A US Standard), don't need to pay extra for adapter .Suitable for home nvr security camera system. If you have any questions about this product by HAMROL, contact us by completing and submitting the form below. If you are looking for a specif part number, please include it with your message.